When I’m trying to get my head around the complexity of an issue, I’ll often use the graphic note taking technique known as Mind Mapping. I first learned about mind mapping in graduate school when I was introduced to this technique credited to Tony Buzan. One of my fellow graduate students took all of his class notes this way. Jack carried a large pad and many colored pencils to class with him. I was intrigued. The big idea behind mind mapping is that it aligns with the way our brain works, making it easier to scan and memorize a lot of data. It is also a great way to organize thoughts that you can then see at a glance. The technique is relatively simple. Key concepts radiate out from a central topic. I drew the map you see here when I was starting strategic planning with a tourism council. By creating the map, I was able to capture my understanding of the tourism ecosystem or tourism landscape and check that out with my client. I developed this map for a particular geographic region. Your tourism map might look slightly different depending on where you live. With the map as a guide, I was able to help my team evolve a list of key informants for community interviews and to help drive data collection. Mind maps use this radiating approach, with color and lines showing connections. If I had more artistic talent, I might put images into my map to make them even more memorable. You can find software to create mind maps for yourself and to share with your colleagues. I use those now and then. But sometimes, just getting out the pens and colored markers are quite enough to organize my thoughts. Mind mapping calls to me in part because it reminds me of the sentence diagramming I was taught to do in junior high school. (I admit it. I was such a geek). 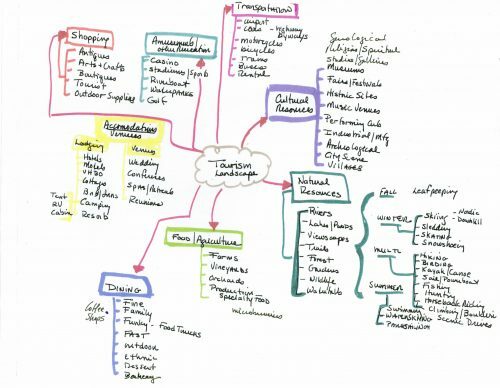 Do you use mind mapping? For what purposes? Do you have software you’d recommend?